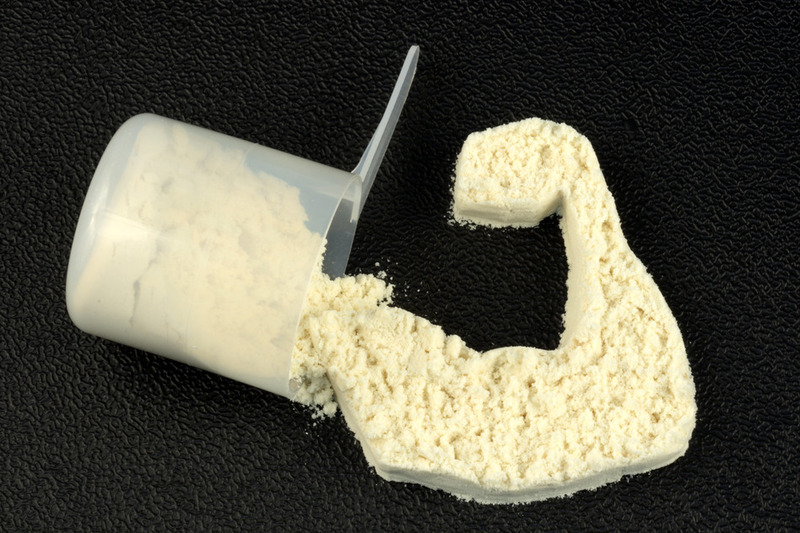 With so many options out there, what is the best protein powder for building muscle? We have two main sources of protein: whole food protein and supplement protein. Whole food protein is, as you guessed, protein that comes from natural food sources, such as beef, chicken, fish, etc. The best forms of whole food proteins for building muscle are chicken, turkey, lean red meat, fish, eggs, and dairy. If you’re vegetarian, your best options are eggs, low-fat cottage cheese (Organic Valley is my favorite brand), low-fat European style (Greek) yogurt (0% Fage is my favorite), tempeh, tofu, quinoa, almonds, rice, and beans. While we’re on the subject of vegetarianism, some people claim that you must carefully combine your proteins if you’re vegetarian or vegan to ensure your body is getting “complete” proteins (all of the amino acids needed to build tissue). This theory and the faulty research it was based on was thoroughly debunked as a myth by the Massachusetts Institute of Technology, yet it still hangs around. While it’s true that some sources of vegetable protein are lower in certain amino acids than other forms of protein, there is no scientific evidence to prove that they lack them altogether. Protein supplements are powdered or liquid foods that contain protein from various sources, such as whey (a liquid remaining after milk has been curdled and strained in the process of making cheese), egg, and soy (the three most common sources of supplement protein). Which sources of protein do you like most and why? Have anything else to add? Let me know in the comments below! There are a few things you should know about eating protein. First is the subject of how much protein you can absorb in one sitting. Studies relating to this are very contradictory and disputed, mainly because it’s a complex subject. Your genetics, metabolism, digestive tract health, lifestyle, and amount of lean mass are all important factors. But in the spirit of keeping things simple, here’s what we know: you can eat and properly use a lot of protein in each meal. How much, exactly? Well, your body should have no trouble absorbing upwards of 100 grams in one sitting. That said, there aren’t any benefits of eating this way (I find gorging quite uncomfortable, actually), but it’s good to know in case you miss a meal and need to make it up by loading protein into a later meal. Another thing to know about protein is that different proteins digest at different speeds and some are better utilized by the body than others. Beef protein, for example, is digested quickly and 70-80% of what’s eaten is utilized by the body (the exact number varies based on what study you read, but they all fall between 70 and 80%). Whey protein is also digested quickly and its “net protein utilization” (NPU) is in the low 90%s, which means that 90-something percent of it can actually be used by your body. Egg protein digests much slower than whey and beef and its NPU also falls in the low 90%s. NPU and digestion speeds are important to know because you want to rely on high-NPU proteins to meet your daily protein requirement, and you want a quick-digesting protein for your post-workout meal and a slow-digesting protein for your final meal before you go to bed. So, the best protein powder for building muscle comes down to the three I just listed: egg, whey, and casein. 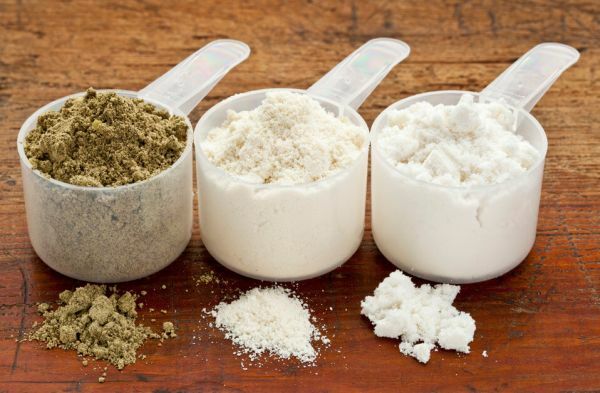 If you’re a vegetarian or vegan, I recommend brown rice and/or pea protein and not soy, (and I explain why in this article on the best protein powders for women). Now, there are a million different brands of protein and many are marketed and hyped. It can be hard to choose. Well, I’ve tried many different protein powders, and I recommend LEGION WHEY+, Healthy ‘n Fit’s 100% Egg Protein, and Optimum Nutrition’s Natural Casein. For a vegan/vegetarian powder, I like Sunwarrior’s Raw Vegan product. Now, regarding when to eat slow- or fast-digesting proteins, I recommend eating a fast-digesting protein like whey after working out to quickly spike amino acid levels in your blood and stimulate muscle growth, and eating a slow-digesting protein like egg or casein 30 minutes before going to bed, as research has shown this helps improves recovery. For the rest of your supplementation, you can use whey or egg. I like egg more because too much whey tends to bloat me.